Were you wondering if I had a green tree anywhere in my house? Well guess what I do. It’s a good one too covered with my vintage Santa collection. Don’t let that pool and blue skies fool you. I swear it is December here in Austin. Just ask my kids. 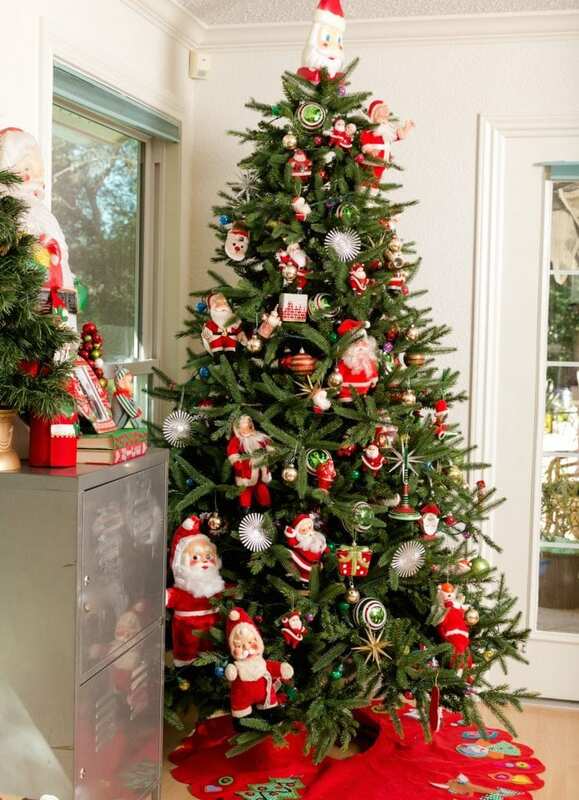 I thought for today’s spotlight on the 2015 Treetopia Design Council I’d share my more traditional Christmas side. Just in case you were afraid I didn’t have one. 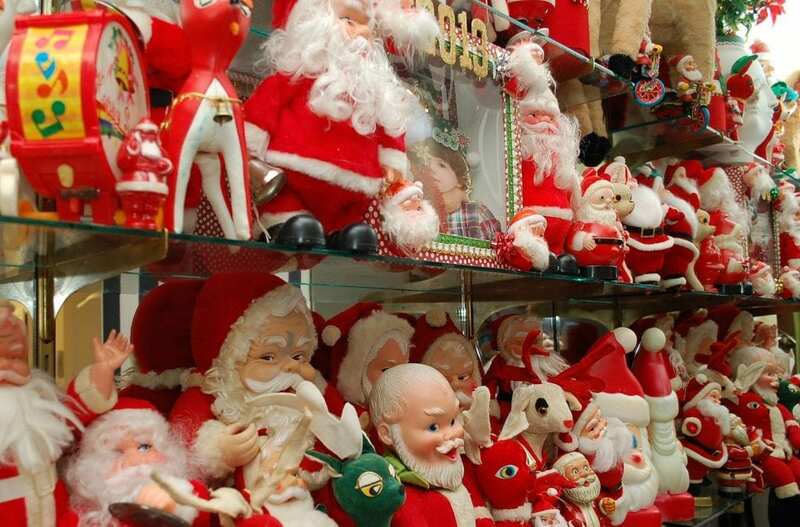 I have a few vintage Santa dolls. Just a few. Here they are last Christmas ya know, hanging out doing what stuffed Santa dolls do. 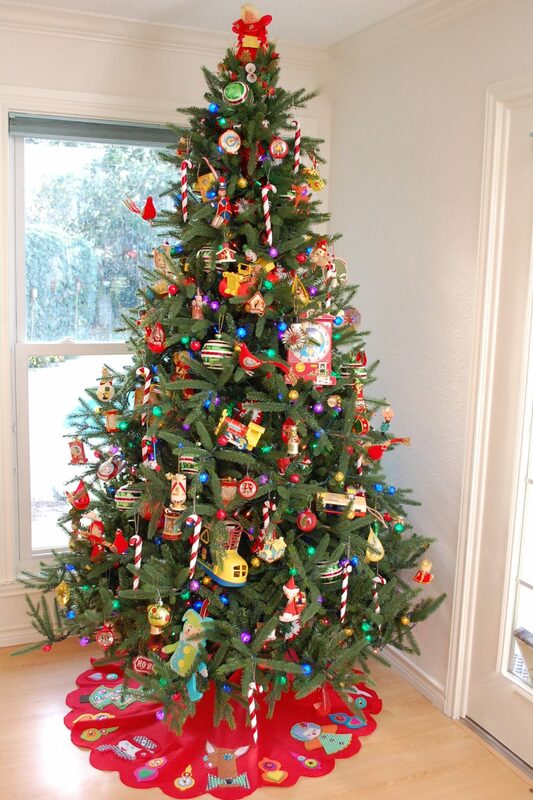 Last year I displayed my vintage Fisher-Price Toys on the Treetopia Oh Christmas Tree. 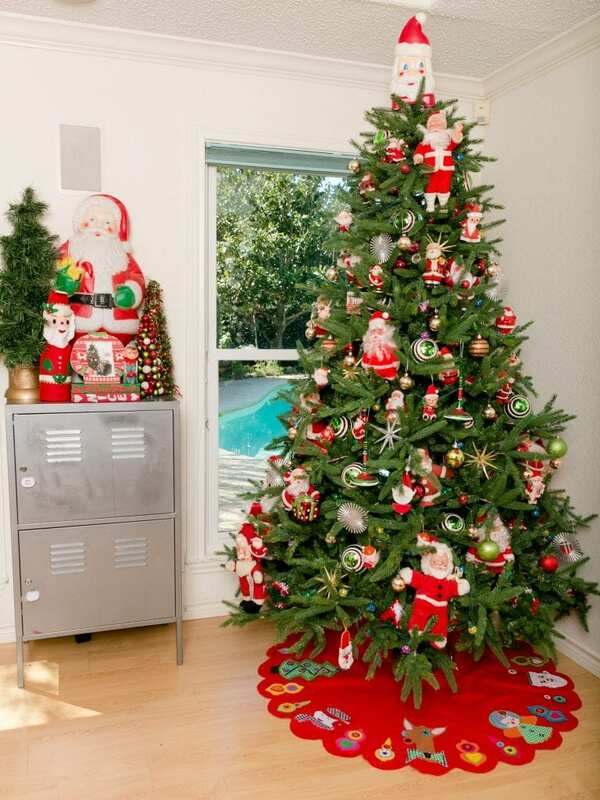 Have I mentioned how great Christmas trees are for displaying collections. Ya they are. Oh and you know you want to make your own no-sew felt tree skirt. Might I suggest this one or maybe this one. So back to this year and all my Santa dolls. I do love to run with a good theme and during the holidays Santa is a pretty good one. 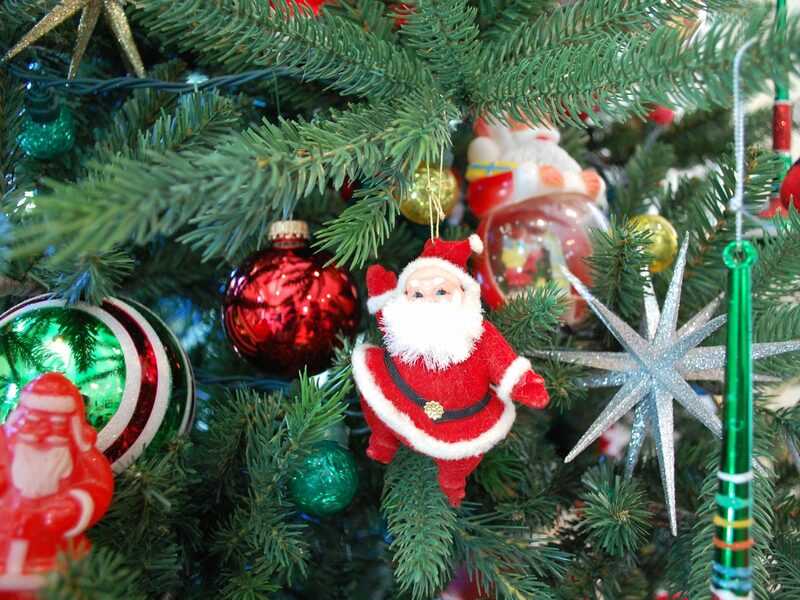 Check out my Santa tree (and more) over on DIY Network. You might have already guessed it, but this is the only green tree in my house at the moment. 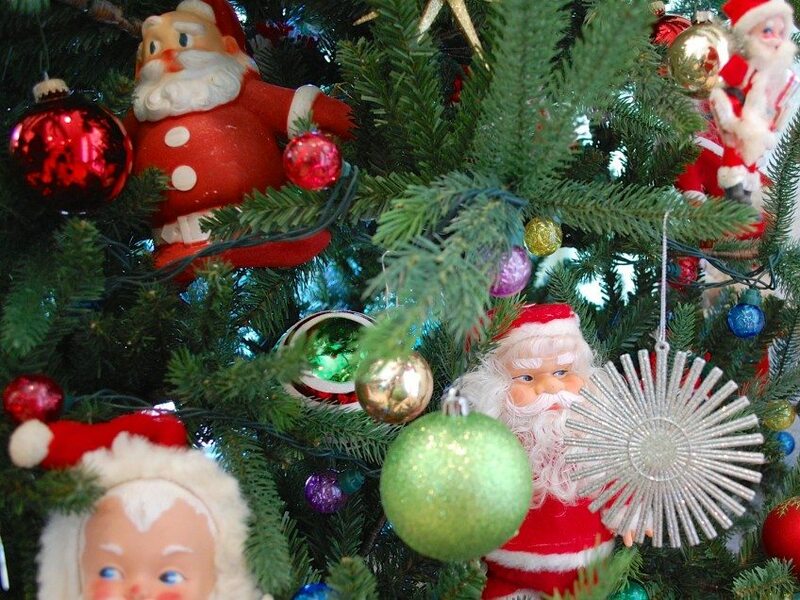 Snowglobes, plush, rubber-faced and more if it’s vintage and Santa it is on my tree – but enough about me. Let’s talk today’s Treetopia Design Council members. I’m telling you we picked some goodies this year. I never thought I’d be mentioned in the same breath with some of these super talented people. The ladies of Lolly Jane show how to add a village to a Christmas tree. Can we talk about how cute that gumball machine snow globe is. Aunt Peaches went and put a bird on it. She just decorated the WHITE HOUSE for Christmas people. I mean come on. I’m trying to admire the vintage inspired tree by Flamingo Toes but all I can think about is how to make that floral cross-stitched chair mine. My house may one day sink from the weight of all the Maggie Holmes stickers and various other scrapbooking goodies. In the meantime I will bask in the fact that we both have a Treetopia Oh Christmas Tree. Posted December 4, 2015 & filed under Christmas, Holidays.